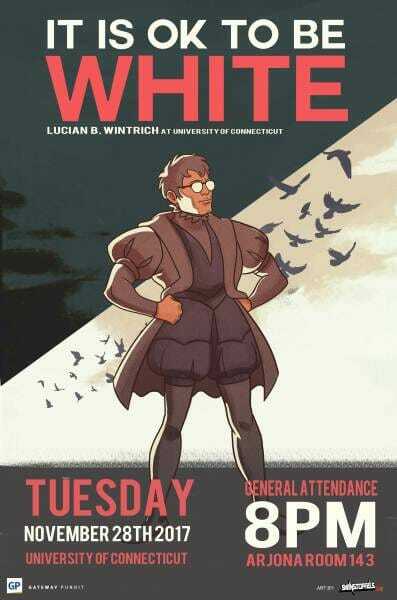 The Gateway Pundit’s Lucian Wintrich is scheduled to speak tonight at 8PM EST at UConn, but some students and liberals have been tearing down his posters and plan to rally in protest of the event. FOX61, the local affiliate, reported that Wintrich’s scheduled speech has “caused an uproar on campus” with students tearing down the posters advertising the event. Both students and progressives are expected to rally in protest of the speech, which is titled “It Is OK to Be White”. One student stated that they felt the event was not “necessary on campus” and questioned the university for their decision to allow the event. The university noted that they “do not stop speakers on the basis of content” but made it clear that they do not necessarily endorse Wintrich or the content of his speech. This story is currently developing and we will try and bring live video of the event.